The media is biased, but not in the way most commentators think. By focusing on whether the media is harder on Republicans or Democrats, we’ve missed a more important bias: toward things that matter to the rich. This bias, by linking the state of the economy to how the rich are performing, ends up benefiting Republican candidates. Media are subject to a deep availability bias: They write about the things they know and things that interest them and the people who surround them. This ends up giving coverage an upper-class tinge. To take a few examples, consider the longbattle over reclining airplane seats, which garnered three full Upshot stories (withUber getting at least six). Meanwhile, Upshot has done scant, if any, coverage on payday lending, employer credit checks, abusive scheduling, the desperate state of American pensions and the rise in abusive “rent to own” selling. It sounds almost impossible, but Upshot has published more stories on airplane seating than predatory payday lending. This isn’t entirely a critique of the Upshot; it’s delivering content that its readers are interested in. An editor might be hard-pressed to devote large amounts of space, even online, to stories that affect very few of its readers. The result is often stark, however, like the New York Times’ cutting its race beat at a time of deep racial turmoil, while continuing to report on the housing whims of the rich(and the ideal way for them to reduce pesky arm fat). More concretely, journalists will often use the Dow Jones Industrial Average or the S&P 500 as shorthand for the state of the economy. This is misleading, however, since the richest 10 percent of Americans control 83 percent of financial assets. Morethan 50 percent of Americans don’t own any stock, and are therefore unaffected by the stock market. Why does this matter for politics? It helps explain a persistent paradox in American politics: the fact that during the postwar period, the economy performs far better under Democrats, but Republicans have managed to hold the presidency more than half of the time. 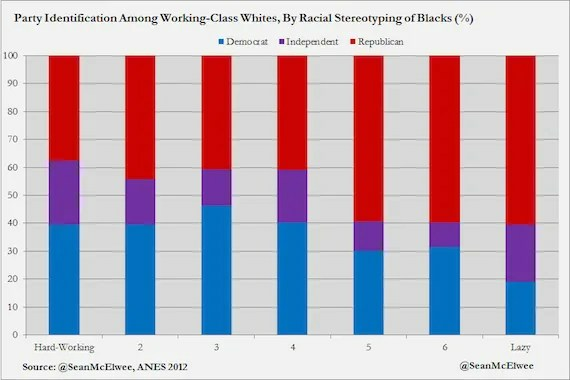 But growth isn’t just faster under Democrats, it’s far more equally distributed between class and race. Under Democrats, incomes for the low-income and middle-class Americans grew dramatically faster than under Republicans. Political scientist Larry Bartels’ results (above) are striking and they raise a question: Why on earth would low-income and middle-income Americans ever vote for Republicans? Bartels presents three theories. First, what he calls myopia. Upon reexamining the data, Bartels discovered something odd: Most of the Republican income growth happens on the fourth year of a presidential term, while most of the Democratic income growth happens on the first year. 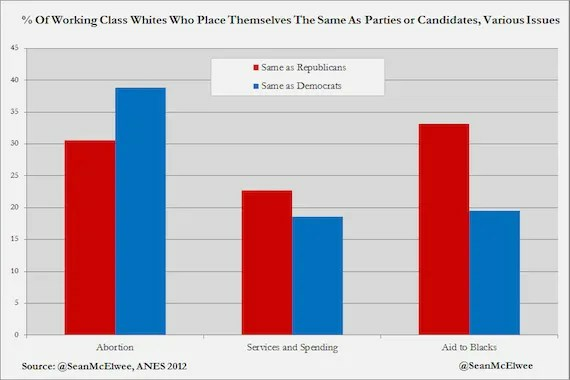 The result is that voters, who remember only their most recent economic experience, end up voting Republican. Second, Bartels finds that Republicans have a distinctive campaign finance advantage, which has helped them win in key elections. He finds that “Every Republican incumbent (or successor) has spent at least slightly more than his Democratic challenger, while every Democratic incumbent (or successor) has spent at least slightly less than his Republican challenger.” A recent study finds that this advantage continues: Citizen’s United boosted Republican chances in state House races by about 4 percentage points overall. While these two factors are certainly important, the most surprising thing Bartels finds is that low-income and middle-income voters are more sensitive to the income growth of the rich. The effect he finds is impressive. A 1 percent increase in real income growth would increase the vote share of the incumbent party by 2.3 percent, while a similar increase in income for the richest 95 percent would boost the incumbent vote share by 10.2 percent. 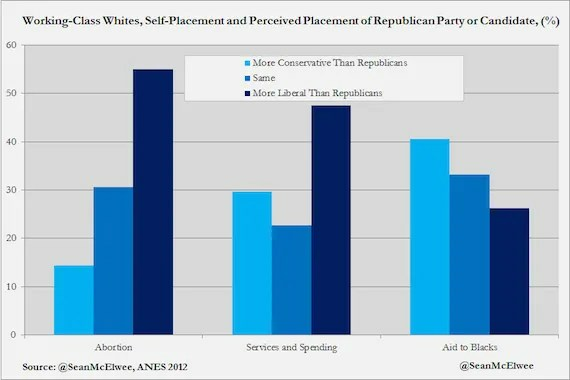 Together, these factors were powerful enough to swing four postwar elections (1956, 1968, 1980 and 2000) in favor of the Republican Party (see chart). The chart shows how much higher the Republican vote margin was because of the three factors Bartels observes. Over the full period, the three added, on average, 9.5 points to the Republican popular vote margin. The Republicans also benefit from structural factors, as I’ve noted elsewhere: Majoritarian systems favor right parties, low turnout (particularly in midterms) and some well-placed Supreme Court justices to deliver the closely contested 2000 election. Republicans benefit from the fact that journalists are loath to seem biased. Even reporting basic facts, like the fact that while Republicans claim to be interested in cutting deficits, the deficits actually rise faster under Republicans, would seem partisan. The result is that the truth about the parties remains widely unknown: A 2014 poll found that Americans trust Republicans to deal with the federal deficit 42 percent to 36 percent. Indeed, despite having presided over higher unemployment, lower GDP growth and higher inflation, Americans consistently say they trust Republicans more with the economy. Pew reports that in 2015, 44 percent of Americans said the Republican Party would do a better job dealing with the economy compared with 41 percent for Democrats. This is striking given that Americans are living through the Obama recovery that directly followed a dramatic recession under Bush. At the same time, 60 percent of Americans say that Democrats care about the middle class, compared with 43 percent for the Republican Party. 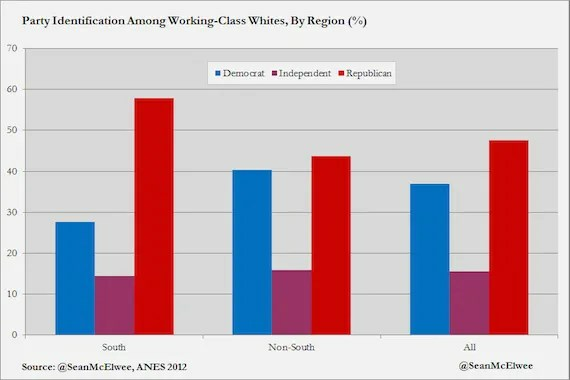 But research showsthat middle-class economics is far superior to the Republican Party’s “trickle down” economic agenda. As Nixon realized long ago, facts do not matter, only opinions do. And Republicans have successfully goaded, cajoled and manipulated the press so deeply that their flawed economic agenda appears beneficial. But it is merely a facade: Recent research suggests Republicans boost the stock market (benefiting the 1 percent) while Democrats reduce unemployment (helping everyone). What can be done? First, progressives desperately need to combat the trickle-down narrative. They need to give Americans plausible reasons for why their policies are better for the economy. Middle-class economics is certainly one part. The fact that progressives direct economic growth toward lower unemployment rather than a fatter stock market is another. I’ve outlined 11 reasons why progressive policies grow the economy faster. Progressives need to make an equitable growth narrative central to their campaigns, and deliver on promises to help low-income and middle-class Americans. The progressive agenda of a higher minimum wage, a more robust social safety net, universal paid sick leave and debt-free higher education would bring around many voters. 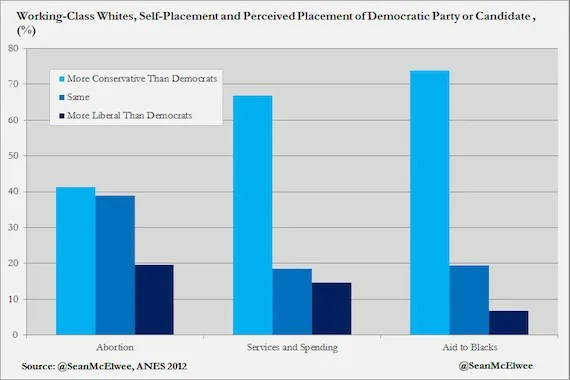 Second, those who benefit from progressive policies are least likely to turn out to vote, while the wealthy whites who benefit from conservative policies overwhelmingly turn out. Boosting registration and turnout is thus key. Finally, progressives shouldn’t be afraid of fighting for racial justice. We need an economy that works better for everyone. 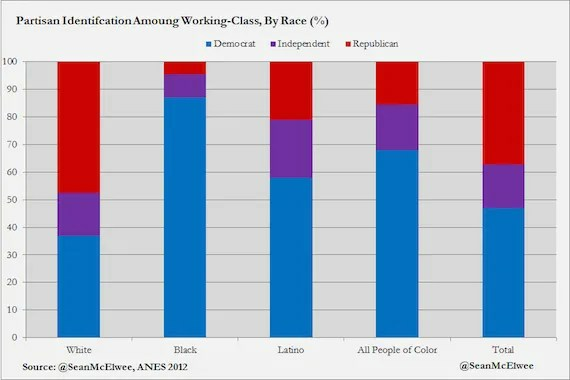 The progressive agenda can’t just be focused on the white middle class, but it would be absurd to pretend that a policy agenda for racial equity would sacrifice the interests of working-class whites. As I’ve shown, progressive presidents close income gaps between whites and people of color while also benefiting white people. Progressive policies offer a better world for everyone — while conservative policies pit the poor against the rich. Instead of the zero-sum economy conservatives offer, progressives can offer broad-based economic growth that will benefit all Americans. This entry was posted in Inequality, Media, Politics on January 30, 2016 by seanadrianmc@gmail.com. The American military budget is massive. At $610 billion, it dwarfs the combined military budgets of China, Russia, Saudi Arabia, France, the UK, India and Germany (see chart below). Put another way, one third of all military spending the world comes from the United States. The problem is, however, that the American military budget may be crowding out other crucial investments. As the era of American hegemony winds down, it’s more important than ever for America to be able to demonstrate soft power. That means first, an American model that works, for other countries to emulate. But further, it means a highly educated population, long-term investment in infrastructure, adequate healthcare, an society based, above all else, on opportunity. However, it’s likely that the military budget precludes these important services. The most important cost of our bloated military budget is investment in other important government functions. As the chart below from CBO shows, defense spending has historically consumed more than half of the entire U.S. government discretionary budget (spending on veterans eats up mandatory spending as well). In 2014, discretionary defense spending was double Medicaid spending, and about equal to Medicare spending. Given that the U.S. is already a relatively low-spending country, the military only further diminishes our meager safety net. The effect of our outsized budget is felt in other ways. Surplus goods are often sent to local police offices, who end up with grenade launchers, weaponized aircraft and “tank-like armoured vehicles.” Concomitantly, police killings have increased (according to the best data available) and the police have begun to seem like an occupying force. This has a profound effect on trust in civic institutions and the police. As trust in police officers decreases, they find it harder to do their job and the community grows even more skeptical. There’s also the likely possibility that the availability of military force makes it more likely, by making non-military means less attractive. The current conception of national security is far too limited. As violent deaths from war and terrorism decline, the greater threat to Americans is their failing infrastructure, costly healthcare system and incoherent environmental policy. The Obama White House has warned on numerous occasions that climate change and shoddy infrastructure are a deep threat to American national security. In 2007 a report by numerous high-ranking military leadersfound, “Global climate change presents a serious national security threat which could impact Americans at home, impact United States military operations and heighten global tensions.” The Pentagon has been worried that climate change is a national security threat since even earlier, releasing a report in 2003 discussing the implications of global warming. The Department of Homeland Security has consistently warned that aging infrastructure is a national security risk. Worryingly, however, the United States has devoted increasingly less money to infrastructure, and in the future, this will only grow worse. Josh Bivens of EPI finds that every proposed budget in 2013 except the Progressive Caucus budget, would dramatically decrease public investment as a share of GDP. In addition, our ability to lead by example is threatened by poverty, homeless and rampant inequality. A recent survey found that internally, the view that America’s economy is the leading one has declined dramatically. The American model looks increasingly unappealing to emerging economies, who have seen the American middle class become less vibrant and more straddled with debt. The New York Times recently reported that the American middle class was no longer the world’s richest. Matt Bruenig notes thatfurther down the income distribution, America does even worse: the poorest 5th of Americans have less disposable income than those in 14 other countries. Finally, without a highly educated population and an innovative economy, America will no longer be able to exert the soft-power necessary as our hard-power advantage declines. Even Americans are increasingly skeptical of the American model, with a 2012 survey finding that 63% believe the American economic model is broken. This entry was posted in Politics and tagged military spending on January 25, 2016 by seanadrianmc@gmail.com. This entry was posted in Politics, Race on January 22, 2016 by seanadrianmc@gmail.com.